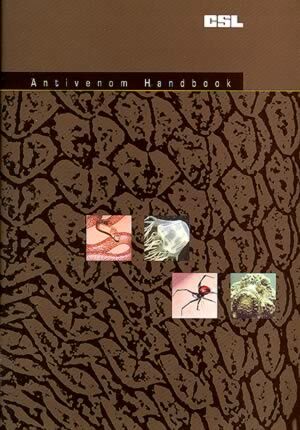 This book, designed for doctors and hospitals, provided information on indications and use for all CSL Ltd antivenoms. It was published by CSL Ltd , 45 Poplar Road, Parkville Vic 3052 AUSTRALIA in 1996 and revised in late 2001 . This web site was made possible by support from CSL Ltd. It is part of the Clinical Toxinology Resources web site and is not the official web site for CSL Ltd.